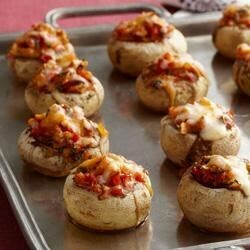 "Mexican-inspired stuffed mushrooms filled with cheese and red bell peppers make a quick great appetizer or snack." Remove stems from mushrooms; chop stems. Heat dressing in medium skillet on medium heat. Add stems, onions, peppers and garlic; cook and stir 5 min. or until onions and peppers are crisp-tender. Stir in cilantro, seasoning mix and 2 Tbsp. cheese. Spoon into mushroom caps; place in single layer in shallow pan. Bake 15 min. ; top with remaining cheese. Bake 5 min. or until mushrooms are tender and filling is heated through. Special Extra: Add 1 chopped canned chipotle pepper in adobe sauce to vegetable mixture before spooning into mushroom caps. Nutrition Bonus: These tempting appetizers, made with better-for-you products, can be part of a healthful eating plan. And as a bonus, in addition to providing both colour and flavour the red peppers provide an excellent source of vitamin C.
Nutrition Information Per Serving (2 stuffed mushrooms (42 g)) : 35 calories, 1.0 g total fat, 0.5g saturated fat, 5mg cholesterol, 120mg sodium, 4g carbohydrate, 1g dietary fibre, 2g sugars, 3g protein, 4%DV vitamin A, 30%DV vitamin C, 4%DV calcium, 2%DV iron. Recipe nutrition information prepared by Food to Facts for KRAFT Canada Inc. I thought these were delicious. I did not have less sodium taco seasoning so i used sloppy joe. Tons of flavor and hardly any calories. The cilantro is rockin' in it. these just didn't work for me. first time i've made stuffed mushrooms of any sort where they weren't all eaten. I didn't have any taco seasoning, so I substituted 1 tsp. "Arizona Dreaming" (a Penzy southwest salt free alternative). I also used taco seasoned cheese. These were delicious!